The EKINOPS 360 — a dynamic, multi-reach, multi-rate transport system platform supporting all DWDM and CWDM and single fiber applications. 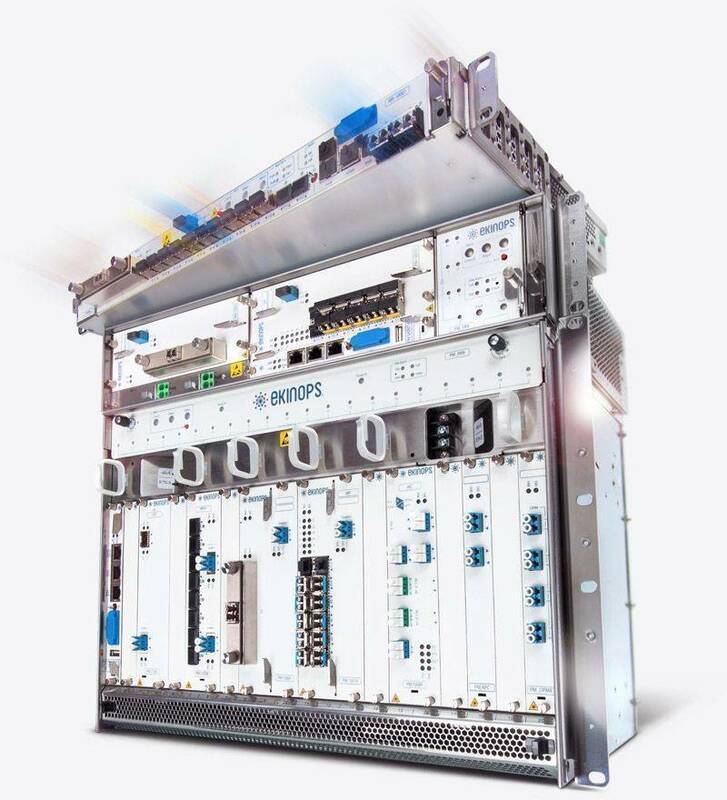 The EKINOPS 360 is a dynamic, multi-reach optical transport system providing advanced networking capabilities for access, metro, regional and long haul applications based on its unique programmable hardware that delivers today’s solutions using tomorrow’s technology”. At the heart of the EKINOPS 360 lies the T-Chip (Transport on-a-Chip Technology) that enables fast, flexible, and cost-effective service delivery. The T-Chip provides a programmable infrastructure capable of supporting any application type - both existing and future - from a common platform to speed the development and lower the cost of the EKINOPS transport solutions. Having all capabilities on a single chip provides cost and manufacturing efficiencies which in turn provide for fast and cost-effective service delivery. The 360 platform also supports EKINOPS patented DynaFEC technology that delivers superior Forward Error Correction for greater reach even over older fiber. The EKINOPS 360 platform delivers rates from 100Mbps to 200G today and can scale to 400G and beyond. The T-Chip is produced exclusively by EKINOPS and is not dependent on component manufacturers for new transport capability on the 360 system. This means EKINOPS can deliver functionality ahead of the market providing our customers a distinct and sustainable competitive advantage. The EKINOPS 360 also offers a wide range of optical layer solutions from amplifiers to a truly scalable ROADM. These solutions allow our customers to minimize their upfront costs and grow their networks in a profitable manner. The EKINOPS 360 platform is a NEBS Level 3 certified and ETSI compliant rack mountable transport system that spans metro, regional, and long haul applications. It supports a wide variety of data protocols and rates with channel plan options scaling to over 16 Tbps. In addition, the EKINOPS 360 platform offers a single fiber option that supports up to 640 bi-directional 10 Gbps channels or 32 bi-directional 200G channels today with larger channel options planned for the future. The 360 platform consists of a modular 7RU chassis for high density applications, a modular compact 2RU chassis for low-density applications, as well as 100G transponder and muxponder White Box shelves in 1RU form factor. With its unique combination of programmability, service density and configurability, the 360 platform offers unprecedented levels of flexibility to meet any network challenge. The platform includes optical multiplexers (Mux/Demux), reconfigurable optical add/drop multiplexers (ROADM) and optical amplifiers (OA). Mux/Demux filter modules are designed in a modular fashion to accommodate channel growth without service interruption. A single system that scales metro, regional and long haul distances over 2000km with full channel counts as well as submarine networks up to 10,000 Km. Legacy DWDM system migration, aggregating multiple protocols into a single legacy system wavelength or service, protecting your past investment. The capabilities of the EKINOPS 360 platform are delivered using the modular flexibility of the C200HC and C600HC chassis, as well as the fixed configuration RM 10001-WB and RM 10010-WB transponder and muxponder shelves in a 1RU form factor. EKINOPS high-speed 100G and 200G coherent solutions are designed to deliver the highest capacity transport available at the lowest cost per bit for both greenfield networks as well as alien wavelengths on existing networks for all applications from metro access to ultra-long haul. EKINOPS offers a variety of 10G modules to support virtually any type and mix of client services from Ethernet to Fibre Channel to TDM to video over a single 10G wavelength. We also support 8G, 10G and 16G FC on a dedicated transponder module. EKINOPS offers a variety of low speed aggregation (<10G) and media converter modules. EKINOPS has added standards-based OTN capability to our patented T CHIP® (Transport on-a-Chip technology), so it is both compatible with existing EKINOPS systems and fully interoperable with a multi-vendor environment including OTN switched networks. EKINOPS Extended Temperature Range (ETR) solution ensures that your critical infrastructure will function even when located in an unconditioned environment. Each of the individual components are purpose-built to provide failure-free operation even when the temperature is as low as -40° C or as high as +65° C.
EKINOPS offers a full suite of optical layer modules including EDFA and Raman amplifiers, mux/demux filters, fixed and reconfigurable optical add/drop multiplexers (OADM/ROADM), protection switches (OPS) and dispersion compensation units. The EKINOPS CelestisNMS provides a single network management platform to manage all service types and rates delivered by the EKINOPS 360 platform.